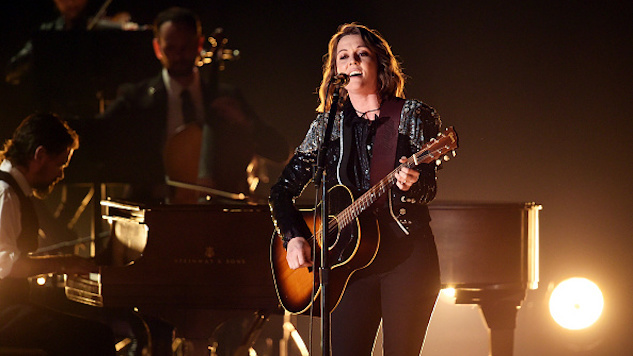 2019 Grammys: Brandi Carlile Wins the Night With Breathtaking Performance of "The Joke"
The joke’s on you, Neil Portnow. Last year, after male artists dominated the major categories, the outgoing Recording Academy president suggested that female artists need only “step up” if they want to compete with their male counterparts. As for the 2019 Grammys ceremony, there’s no doubt about it: Women dominated the show, the winners list and the night as a whole. Michelle Obama made a cameo, a team of female artists including Katy Perry and Miley Cyrus honored Dolly Parton in a tribute, Dua Lipa and St. Vincent performed a steamy medley and Kacey Musgraves snagged hardware for Best Country Album and Album of the Year. It was a good night for women and the LGBTQ+ community. “The Joke” is an anthem for the marginalized. “Don’t ever let them steal your joy,” Carlile sings. “And your gentle ways, to keep ‘em from running wild.” After a bleak year, both for the Grammys and for the country, Carlile’s breathtaking performance of this song was the perfect way to sum up a (mostly) jubilant night. In choosing this year’s performers and many of the winners, it would seem the Recording Academy were the ones doing the stepping up. Watch the spectacular performance right here. You can find all the 2019 Grammy winners here. Below, watch Brandi Carlile perform in the Paste offices circa 2010.